Hi there! This is going to be a dance post for those who enjoy such frivolity, but before I get to that, I wanted to briefly plug Allison Gingras's show, since I'll be a guest on there tomorrow, November 24th. :0 Here's all the deets: Her show is A Seeking Heart, and airs live from 10-11 am EST. If you want to listen live, head to the linked site and peruse the top menu bar. You have the option to either download the Breadbox Media app to your mobile phone, or you can click "Listen Live" and just stream it on your computer or device of choice. If you're available during that hour, you can also call in to talk to Allison and I. :0 Oh, do it, do it! I know not everyone is available in the middle of the morning like that, but if you are, you are MORE THAN WELCOME to join us! Allison will give the phone number out during the show, so tune in! To listen after the fact, go to the "Podcasts" link from the menu, and then navigate to A Seeking Heart. A downloadable file of the show will be available sometime shortly after the show airs. I'll also post a link on here. Keep your eyes peeled! OK, so that's tomorrow, super exciting, right?! I'm looking forward to it. Unfortunately, I'm sick, so I'll be all scratchy, but it can't be helped. Which segues nicely into my dance adventures from the weekend. Got your coffee or tea? Good, so do I.
Friday morning I woke up with a sore throat. This was particularly ominous because, (a) Anne has been sick with a cold and coughing for some time now, meaning I most likely got whatever evil she has, and (b) I had a dance performance Saturday evening, and you know what happens when I get sick, right? Right. No matter how minor the illness, I get a fever rash on my neck and chest. Already, not so attractive, yes, I know, but in a belly dance costume? Downright scary. People look alarmed when this happens. I was not looking forward to repeating this experience, but I had zero control over it. So I went to our final troupe rehearsal Friday evening treading lightly on not overtaxing my body. We ran through all of the group numbers (for this hafla we chose our pop piece and drum solo, the new veil and baladi piece, and the kicky Shaabi number), and because the performance would be in the studio and hence in a "in the round" style of seating, we changed orientations for each dance, so that no one area would always be the back and therefore unable to see anything. This is lovely, indeed, but gets confusing for belly dancers with cold-induced foggy brains. When you're used to facing one way, and then we split the drum solo up into two trios of dancers facing two totally different ways... the instant I take myself off of Dance Auto Pilot and think about it, I have no idea where I am and what I am supposed to be doing. :0 This happened a few times over the course of the night, but I tried to reorient my mind and brain as best I could. All went well, and I tucked myself in for a good night of sleep at home, praying for no rash to appear overnight. They're insidious like that. I did indeed sleep well, and my throat felt, while not *better*, decidedly less bad upon wake up. I quickly hurried to the bathroom mirror for the big moment, and the verdict was in: no rash. Whew! I was all relieved until I noticed something else. Prepare yourself now for a little TMI, because this is gross. :0 I had some sort of either insect bite or...SOMETHING, bright red and disgusting glaring out at me from my upper abdomen. Why, why, why am I cursed with this sensitive skin?! And yes, I do oftentimes wear two-piece costumes, which would definitely showcase this new not-so-little development. I'm talking this thing actually made me jump when I caught sight of it in the mirror. While not quite as horrifying as the rash, my new friend was still quite unattractive and unwelcome. I searched hurriedly for one of those small, circular band-aids that I figured would hide the yuckiness and wouldn't show much, but then realized that Anne had used them all as "stickers." Thus, I was stuck with makeup and a hope for the best. But I figured if that was the worst thing that happened, it wouldn't be so bad, right? That sounds like a lead up to something unfortunate, but it isn't. :-) Everything went well, including my heavily powdered belly. We were wearing our pink costumes for the first set, and the long fringe on the top actually covered up The Gross Thing. I was still VERY nervous, and I suppose this is just part of performing for me. I do love it, but the jitters are not going anywhere anytime soon, and that's not necessarily a bad thing, I suppose. It just means that I always endeavor to put my best foot forward. Finally, my music started, and out I swirled. My new costume has a flowy chiffon skirt, and I loved it. It made my climactic spin sequence super fun. ;-) But I thought it went well! My music had several dramatic pause moments, and for the first time, I really used them. I think the most difficult thing to do in dance is to pause. Everybody is staring at you, watching you, and to stand still is hard. Through the years of performing though, I've realized how important it is to let the music "tell" you what to do. And if the music says pause, I pause. I've been working on that, along with keeping better control of my arms and hands when I dance. We want graceful, ballet dancer arms and tucked thumbs, no jazz hands! But when you're also thinking about smiling and what the heck you're doing with the rest of your body, well, the arms/hands can get lost in the shuffle. ;-) That has been my pet project this fall. Lots of painful practice video critiques, but it's the only way to get results. I progressed through my music and shone my Beatific Performance Beam on anybody I laid eyes on. American audiences tend to be very quiet and subdued (this is seen as the polite way to behave, but as a performer, it makes you feel like everyone is bored :)) and I use smiling as a way to draw people in more. They smiled back. Anne waved to me. Everyone seemed to enjoy when I used a musical accent to clear my hair out of my face. :0 I was pleased. 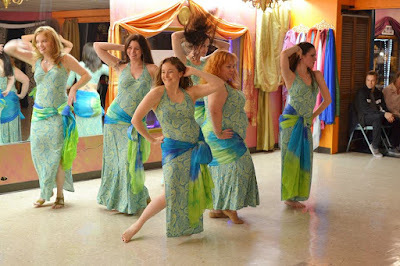 After that, we had the veil/baladi number, which also went well. We moved dressing room locations for this hafla, and the location was SO much better. I got to see and enjoy the other performances, which, besides belly dance, included ballroom dance and a new hula hoop instructor. Can I just say that I positively LONG to take the new hooping class! She was A-MAZING! She could rotate the hoop along every length of her body, from the arches of her feet up to her fingers, all to the rhythm of her chosen music. LOVED. This was definitely a crowd favorite. I'm not very flexible, so I'm not certain that I would be very good at it, :0 but in my head, this is a fantastically fun new thing I'd love to try. I would also love to take ballroom lessons with Mike. He too wants to do this, but right now with teaching and kids' schedules, it's not in the cards. But hopefully someday! In my dream world, I would take a different dance class every night of the week, but you know. Reality seeps in. ;-) It's OK. I'll take my happy belly dance and family bubble. I've got it good. The third set just had the Shaabi piece in it for me, which is old hat at this point. In those wonderfully comfortable Saidi dresses that feel akin to pajamas. I love these women. Dancing with them is one of the great joys of my life. We're talking about learning a new group sword piece over the winter, did you ever?! Sword will be SO EXCITED! And in a group context? This could be very fun. And possibly dangerous. 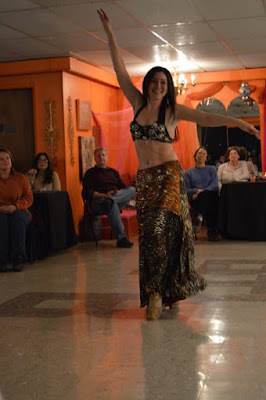 See why I love belly dance so much? How was your weekend, dear reader? I'll try to check in briefly tomorrow. Until then!